Barack Obama responds to John McCain's "I have a message for you" comment. ...the war goes on ...and we continue to get the bill. Rove confronted with ‘Free Don Siegelman’ banner. i would hope the Senator Clinton would reevaluate the advise she is getting or, if this is her idea, shame on her. i do not like being mocked by someone who, if nominated, will be asking me to work hard to get her elected. and then there are all those fine Americans who have been awakened to their civic duty by Senator Obama. how will they feel about her candidacy after being mocked?????.... i want the president of the United States to model the best behavior, not this adolescent, borderline bully behavior. Stop it, Hillary!!! John McCain has spent many years cultivating his image as the maverick who isn't influenced by lobbyist. But behind the image there's a very different McCain with a different set of friends. "I'm the only one the special interests don't give any money to." When George W. Bush first spoke of "the ownership society," he led most Americans to believe, and many did believe, that he was talking about them. Now, four years later, it's easy to conclude that the president, his party and conservatism itself has failed to deliver the ownership society. But the very crises now being described and decried in both the new media and the old can actually be taken as signs of conservatism's success, depending on one thing: identifying who really belongs to the ownership society. Because conservatism, depending on how you look at it, has successfully built the ownership society—albeit a very small, narrowly defined one—and strengthened it by building or expanding its essential support: the society of the owned. The term "owned" has its origins in the realms of hacking and gaming, but I'm only partly borrowing the slang definitions—"To dominate another person or thing so completely as to humiliate them" and "To be made a fool of; To make a fool of"—here. ...With the votes counted in more than 80 percent of Wisconsin's precincts, Obama was winning 58 percent of the vote to 41 percent for Clinton. Wisconsin offered 74 national convention delegates. There were 20 delegates at stake in Hawaii, where Obama spent much of his youth. The corporatists have been very successful selling a spectator democracy to us. Moving to the primary to send delegates on to the national convention, in an open primary state, will seal the deal in Washington State. Our party should not consider using the primary until we publically declare parties. Even then I don't quite get how that would work. The nominees are the choices on the ballot. Who are the delegates? Hmmm....anyway......if anyone thinks we could move to other than the open primary, after the fact, doesn't understand how indoctrinated a fairly large portion of our society is. My parents are trained to hiss and growl if anyone dares suggest they have to declare a party. This crosses party lines. The marketing in this area has been a huge success. The primary came to Washington in an initiative delivered to the legislature in 1988 by the very party elite everybody says they're against. It passed in the legislature in 1989. As we are a membership of voluntary association, supported by our donations, a large part of the grassroot work done by some amazing volunteers, we retain the right to decide how we advance candidates to nomination. We want our party to insist on represention by representatives who also believe in a society where all boats are raised. If the corporatists prevail and we give up our caucus for the primary in this open primary state we will never get it back. In spite of the large price tag of $9,700,000 to the taxpayer, their marketing appears to be working well. Me...........I want to press the flesh and look eyeball to eyeball with my neighbors. I want to keep our democracy. I want to build our neighborhoods and communities. I want a world that is safe, secure and prosperous for all inhabitants of earth. I pledge to work to make our caucus better than ever in 2 years. Let's make our platform the best ever. And every 2 years we can make it great. I want a participatory democracy in real good working order to pass on to those who come after. We have got a lot of work to do and we all need to roll up our sleeves!!!!! I believe we can!!!!! Seattle-Times Chief political reporter David Postman has the news that Rick Larsen may get a Republican opponent after all. There needs to be a new sheriff in Congress, and it’s going to be me. In the '06 race, Larsens opponent Doug Roulstone(R) got his campaign seed money from dozens of Republican Congressmen and fundraising help from the Bush Administration but wasn't getting help this cycle and recently dropped out of the race. With a couple dozen Republican Congressmen having already announced their 'retirement', of course it's going to be tough to raising money to run against a Democratic Congressman who, in '06, strolled to re-election with two out of three votes. Dave Postman reports that Dave Reichert (R) is "Among those urging him to run" and that Reichert calls Bart weekly; Bart says "He’s begging me to run and I keep asking him why and he says he’s lonely." You've really got to wonder if Rick Bart is going to run to win or run to give some cover to beleaguered Republican Congressman Dave Reichert (WA08). Democrat Darcy Burner is running against Reichert and Reichert is running scared. Dave Reichert should be afraid, very afraid. Darcy is a great progressive candidate and she has Howard Dean and the DNC's 50-State Strategy backing her up. More at www.hightowerlowdown.org! We've learned the hard way over the past seven years that George W lives in his own fantasy world--a place in which reality is whatever he wants it to be, facts notwithstanding. Tim Eyman and friends are once again in violation of Washington State's Public Disclosure laws. This morning MajorityRulesBlog filed an official compliant with the Washington State Public Disclosure Commission regarding the lack of filing of campaign contributiuon and expenditure reports for Initiative 985. In a phone call this morning I confirmed with the PDC that there was no error on their part - no reports have been received by them from Eyman besides a C1pc on initial formation of a committee entitled Reduce Congestion.org on January 3, 2008. ReduceCongestion.org has not updated this report with any additional information or reported any contributions or expenditures as of today, Feb 14, 2008. The deadline for filing Jan reports is Feb 10, 2008. Tim Eyman is breaking the law and abusing the initiative process... again. He and his business partners should be held to the same standards as anyone else who runs a political campaign in the state of Washington. Just today the Bellingham Herald ran an editorial complaining about House Bill 2601, which would regulate the work of paid signature-gatherers, requiring them to provide their name, home address and other information. And all signature gatherers, paid or not, would have to sign the petitions they turn in. In their editorial they turned to Eyman for an argument against the Bill: "But we think Eyman is right when he argues that it seems absurd that signature gatherers will have to register with the government to exercise what is considered a basic civic right by our state’s constitution." Tim Eyman has turned filing initiatives into a personal business in which he is extravagantly compensated for championing millionaires personal agenda's. Eyman knows what the reporting requirements are and should be held strictly to account for ignoring the Public Disclosure Laws. Whew!! What an amazing week....I helped make it happen in my little corner of the world. I worked along side amazing dedicated Democrats who volunteered untold hours and put sites together all over Whatcom County. (attendance was up 278%. 3477 in 2004, 9674 in 2008)They trained all of us volunteers to manage our sites (mine had 13 out of the 119 precincts) and run our precinct caucuses. And thanks to the generous donations of great Democrats who suited up and showed up and said “I'll help cover caucus costs”, I had a daunting task ahead as the party treasurer. On Monday morning 3 enthusiastic Obama supporters showed up ready to pitch in. Wow!! They assured this ole gal “no big deal.” It's a big deal to me cuz I get to enjoy the garden as spring approaches and everybody likes me better when I get to do that. I will even be able to handle the calls that continue to trickle in at our office. Most are the disgruntled or lonely or both. We have been receiving the blame for what I believe belongs at the Secretary of State's office. There is so much confusion(no accident in my opinion) about the primary and the caucus. The Democrats in the state of Washington have always used the caucus to select our delegates to move to the presidential nominating convention. The primary came about as an initiative to the legislature in 1988 and passed in 1989. The Democratic party, a voluntary association, makes the decision how we choose our delegates. It is not an election! (The election happens in November.) Democrats from all over the state met this spring and again chose the caucus. This is the only thing that makes sense for us because we are an open primary state and do not publicly record our party. We would have no way of knowing if Democrats were the ones selecting our nominee to the general election if the primary was used. It is my opinion we need to end this spectator democracy and take our democracy back and the caucus moves us in that direction. We can make it better. And we can build the community necessary for our children and grandchildren's future. Yes we can!!! I completely understand why many of you prefer a primary and your frustration with the current system. If you think I'm being facetious, imagine me being the site leader and chair of my precinct of 198 people in a building designed for 65. I won't deny that there are advantages to a primary. More people can vote, more time is allotted to accommodate schedules and mail-in ballots are an option for everyone rather than just some. Now please humor me while I talk about why I love caucuses. While the conservatives talk of the demise of the family, it is the demise of the community that is the real concern. Most of us don't know our neighbors and are far too busy (and too isolated by computers and televisions) to take the time to know one another. The caucus is above all a chance to gather with local folks. It encourages us, not just to talk about candidates, but to talk about ISSUES, something rarely mentioned in the press. When we attend caucuses, we can bring a resolution about any damn thing we want. These resolutions form our county, then state, then national platform. You have a chance to create the political party you want it to be. This opportunity, time consuming as it is, happens ONCE every four years. Ask yourself, is two hours every four years really too much time to get a chance to know who shares your neighborhood? On to delegates. You already know that every state sends delegates to the national convention, and those folks decide the party's candidate. In a primary, you are still choosing delegates, not voting for president. However,you're looking at a set of names of folks you've never heard of before. Who will really represent your candidate? Who is only out for their own advancement? Who is undecided? You have no way of knowing. Not only that, but who gets on that ballot? Activists like me, folks. And I tend to believe that activists like me shouldn't be the only ones getting to go to the national convention. In Washington State, we have an affirmative action goal for our national delegates. We read this at every caucus and encourage people to choose folks who represent diversity. Yesterday my precinct chose folks who were Black, Asian, Pacific Islander and recent immigrants. But the most moving story was a new friend of mine who shyly stood up, introduced himself, and announced that he is transgendered. I could tell he had never spoken these words out loud to a mixed group of people. I hugged him afterwards as did others. He was one of the first delegates chosen. And when it was all over, folks looked around, smiled, and asked how we could keep in touch with each other. That plus this wonderful moment of coming out made the entire lengthy, sweaty process more worthwhile than any damn ballot I've ever completed. Hillary Clinton had some disappointing things to say about the grassroots of the Democratic Party. ... "These are caucus states by and large, or in the case of Louisiana, you know, a very strong and very proud African-American electorate, which I totally respect and understand." Clinton has publicly dismissed the caucus voting system since before Super Tuesday, seeking to lower expectations heading into a series of contests that played to Obama's advantage. His campaign features what many consider to be a stronger and more dedicated grassroots organization than Clinton's. Spoken like a true triangulator. I suppose she's just trying to spin her losses, but her comments aren't doing anything to undo her image as queen of the DLC (the corporatist wing of the Democratic Party). Until yesterday I was all set to get out and work for which ever candidate got the nomination. Now that Hillary has insulted all us "activists", if she does become the Democratic Presidential candidate, I'll certainly make a point of reminding her supporters that they need to get out and campaign extra hard for their candidate. WA state Democratic Party Chair Dwight Pelz has offered to help Republican state Chairman Luke Esser with his caucus vote counting problems. I can get Dean Logan in on short notice. Esser's problem, if you haven't heard, is that Huckabee wants a recount of Republican caucus votes and that's going to be tough because the WA state Republican caucus was a sham. Maybe those Rossi '04 supporters can find a new use for their "ReVote" signs. Whatcom County Democratic Caucus - A Big Deal! Yesterday was the WA State Democratic Party Precinct Caucuses. I spent the afternoon (noon - 4PM) at our local (Ferndale) Caucus. I then spent the rest of the afternoon at the Whatcom Democrats office, helping with the tallying and paperwork needed to compile all the information from the precinct caucuses and report it to the State Party. Those results were: Clinton 23.5%, Obama 74.58%. I was hearing enthusiastic anecdotes about the large turn-out at every Democratic precinct caucus in the County. But I had no idea just what a big deal the turn-out was until this afternoon when the final attendance count was added up. The total number of Democrats who went to caucus in Whatcom county on Feb. 9 was 9674. What makes that a big, big deal becomes apparent when you compare it to the number of voters who choose a Democratic ballot in the 2006 primary (all mail-in voting). It works out that 48.6% of those who mailed in a Democratic primary ballot in '06 made the effort to show up in person at a precinct caucus this year. Wow! (UPDATE) The 2008 Democratic precinct caucus attendance in Whatcom county was nearly three times larger than for the 2004 Presidential precinct caucuses. Double Wow and Zowie! Democrats from precincts in and around Ferndale held their caucuses at the Horizon Middle School. Four years ago at our Presidential caucus we felt the turnout of nearly two hundred was quite good. This time our turnout was phenomenal; over five hundred! People began arriving before noon; happy, enthusiastic people. It was a little frantic at time but things went off without any major hitches. The results for the Ferndale area were pretty much like the rest of Whatcom County: Clinton 23.5%, Obama 74.58%. Obama supporters were elated and Clinton supporters were disappointed but not disillusioned. office immediately. Now I am asking you to join me in supporting hearings by signing the attached letter to Chairman Conyers. As I said in my op-ed with Representatives Luis Gutierrez and Tammy Baldwin in the Philadelphia Enquirer (attached), the issues at hand are too serious to ignore, including credible allegations of abuse of power that if proven may well constitute high crimes and misdemeanors as provided in our constitution. You do not have to believe that the case has already been made to support hearings. One of the important functions of hearings would be to put all the evidence on the table and let the facts determine where to go from there. Chairman Conyers has been a leader in holding this Administration to account for its consistent pattern of ignoring the balance of powers set out by our Founding Fathers and baselessly asserting that it is above the law. I hope that you will sign the attached letter to Chairman Conyers asking that now he join us in support of impeachment hearings as well. Governor Gregiore has endorsed Barak Obama and so have four (count 'em... four) Bellingham Mayors. BraveNewFilms needs help to continue making these great videos. Help them Continue. If you're a Democrat or feel kinda like a Democrat or just don't like the Republicans anymore, Saturday is your chance to help decide who the Democratic Partys Presidential candidate will be. After Super Tuesday the race between Barack Obama and Hillary Clinton is close! At the Washington State Caucus on February 9th you will have a huge role in deciding the next president, we checked out some of the Super Tuesday parties to see how people feel about the race. 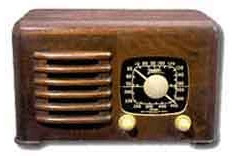 What's Bellingham radio got that Seattle radio doesn't? Tale of two joes: bellingham gets live & local & liberal! here's some amazing video and theory about what happens to humans with a lust for power.....it is a mystery how humans can behave so badly.....i keep thinking..."they have children and grandchildren......i don't get it." 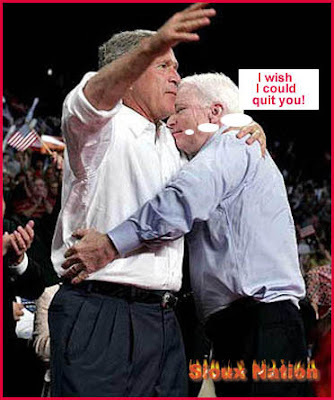 John McCain's 8 yr old daughter is trashed in 2000 by the bush/rove machine and he can't hug on bush enough now...???? i'm gonna go with Jeff's abduction theory and they are dangerous.... here we go into a big presidental election......alls i can say is "brace yourself effie." "TheStepford Wives" tells the chilling story of once smart, independent women who get abducted and turned into tamed, mindless robots. I have a theory about a similarly subversive process that turns grown men once capable of independent and reasoned thought into robotic extremists. Call them Stepford Republicans. The nefarious transformation always occurs before the individual gets close to becoming a Republican president or vice president. It seems the luster has just gone from Dino Rossi's one claim to fame, a budget deal he struck during his one and only term as a state senator. Rossi's campaign has been yammering about a six year projection that sez Governor Gregoire's 2007 would lead to a $2.5 billion deficit in 2013. The trouble with Rossi's finger-point about budgets is that when the same six year projection is applied to the 2003 budget he claims as his own, it shows that HIS deficit will be $5 billion! Josh Feit at Slog has the ugly details. So... with a Rossi budget that has a 'projected' deficit double Gregoires, should we start calling him Deficit Dino? Or maybe instead of 'Dino Rossi (R)' we should all be writing 'Dino Rossi (har har har)'.